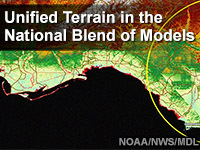 This lesson discusses errors associated with the use of inconsistent terrain in the analyses in the Real-Time and the Un-Restricted Mesoscale Analyses (RTMA and URMA, respectively), and in downscaling numerical weather prediction model data to the resolution of the U.S. National Weather Service National Blend of Models (NBM). The sources of these inconsistencies are examined, and the errors that result are discussed. A solution is to use a unified, consistent terrain in the analyses and the NBM. This solution is only partial however, as resolution of small, meteorologically significant features is still somewhat limited. Poorly resolved physical features will still result in analysis and forecast error in some circumstances. For the operational forecaster, this lesson is not useful. While URMA/RTMA and the changes to it are very useful for areas with rapid terrain difference in their CWA, this system gets in the way in areas terrain changes are not significant or don't have shore lines. Explanation of this topic is not good and is very confusing and makes the subject matter very difficult to understand let alone get buy in from the individual reading it. It was interesting but at times it seemed a little dry but that may just be a result of the subject matter. Thanks for presenting, it opened my eyes to a subject I really don't encounter in my daily forecasting duties. A timely and informative lesson since there appears to be a concerted effort to provide/improve on the "first guess" forecast capability. The unified terrain methods are definitely a step in the right direction. Would be interested to see how representative the unified terrain in the NBM would be in the arctic regions such as Fairbanks AK where some terrain peaks are above a very shallow radiation inversion. The temperatures above that inversion are quite a bit warmer than those experienced at the lower elevations. Great lesson! Recall the terrain data sets used by RTMA/URMA, NBM, and AWIPS GFE/NDFD. Explain the problems created by having multiple terrain data sets in the forecast process. Explain how the Unified Terrain is created. Explain how a consistent terrain dataset is beneficial for creating the forecast and assessing model performance. Summarize the impacts of the new Unified Terrain on the National Blend of Models.